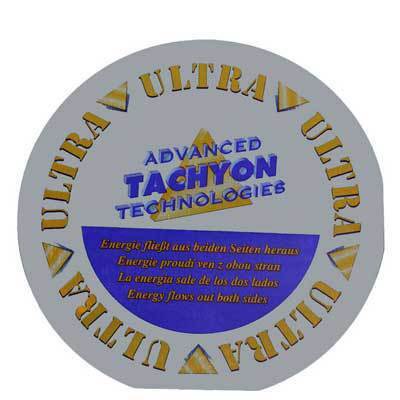 Below you will find articles on Tachyon Research as it applies to the products that are sold on Tachyon Energy Products website. Please enjoy these very interesting and informative articles. Live-Blood research conducted in Germany by researchers Joerg Rinne, HP and Peter Thomas found several significant results in this preliminary study. We would like to share two of these findings here. 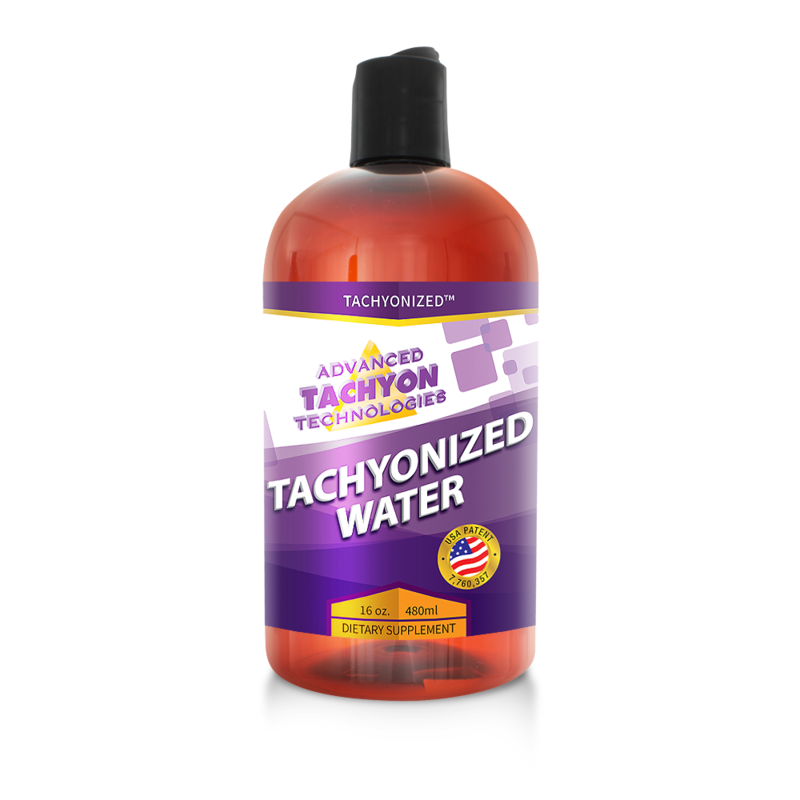 Using a dark-field microscope, they documented the effects Tachyonized™ Water has on live blood. The researchers were quite satisfied that this preliminary research demonstrates the substantial life-enhancing effects of Tachyonized Water. These photos document some of their findings and are excerpts from their original research project. In this study human blood life-force serves as an intrinsic indicator for the qualitative changes induced by Tachyonized materials. The implications once again support our theories that Tachyon unequivocally effects the SOEFs, thereby increasing their energy and ability to maintain neg-entropy, thus retaining life-force and form observed as cellular integrity. One observation was that red blood cell clumping was reversed in about 20 minutes. This confirmed Dr. Cousens’ earlier dark-field study showing the same results in ten out of ten people. The second finding was that Tachyonized Water maintained the life-force of the original blood taken after exposure to Tachyon for eight hours. The other blood sample that had no Tachyon exposure completely deteriorated within the same eight hour period. You can view this in the photos below. The client’s blood is taken prior to any exposure to Tachyonized materials. Clumping of the erythrocytes can be seen. This photo is of the same person’s blood, taken 45 minutes after the sublingual absorption of 15 drops of Tachyonized Water. Already improved, the erythrocytes are singular and free in the plasma. This is the same blood as Photo One. The difference here is that eight hours have elapsed and the blood is dead! Only cell fragments are recognizable. This is the same blood as in Photo Two. After eight hours you can see the blood is still alive and the cells still have their cellular integrity. Live blood studies demonstrate the ability of human blood to quickly absorb the energies needed to increase longevity. This is a significant discovery. Living a life of balance and joy can include a vital health body. As Dr. Gabriel Cousens has stated: “Tachyonized Water might not be the key to immortality, but the research shows that it is a key to radiant health”. 1997© by Gabriel Cousens, M.D. Am pleased to see Dr. Joseph Mercola’s article on the tangible dangers of EMFs to us humans. The dispute concerning the repercussions that cell phones have on human beings has prevailed since their inception. For every study that indicates a link between cell phones and cancer there seems to be a couple of highly funded, high profile studies that conclude there is no link between cell phones and cancer. There may be no consensus, but one fact is for certain: cell phones are an intricate part of a growing majority of wireless communicators. A wireless world has become as natural as an mp3 or a DVD. Our technologically evolving society has quickly forgotten the days of rotary dial phones with 1/2 lb receivers, 33rpm records, 8mm home movies and 10 megabyte hard disks. Trends now indicate that it is just a question of time before the elimination of land line communication networks as wireless technology dominates the horizon. With this “evolution” comes an uncanny array of invisible electromagnetic fields (EMFs), radio frequencies (RF) emissions and microwaves (MW) saturating most metropolitan areas. Let us take a moment and entertain the possibilities of what might happen if cell phones were proven to have a negative impact on health. If cell phones were unilaterally accepted as being a serious health risk it would probably tumble the current telecommunication world as we know it. Considering that most of these companies are held by large international conglomerates, the legal impact could inevitably collapse the corporate structures and possibly even profoundly affect society as a whole. With roughly 2 billion cell phone users, the economic and social ramifications are staggering. Anyone who ever used a cell phone and developed cancer could naturally place blame and financial responsibility on the manufacturer thereby creating a flood of legal actions. For this reason alone, there may never be a collective consensus of opinion on the diverse controversy of whether cell phones lead to cancer or pose any significant health risks. But what is cancer? It may be helpful at this juncture to overlook the label and stigma of the word cancer and focus on the predicament from a different perspective. From the quantum physics point of view, everything is comprised of energy. Everything is either gaining or losing energy. From the holistic perspective, the losing or gaining of energy can be equated with the process of aging or youthing. From the energetic perspective, cancer or any other disease is most certainly a cumulative, entropic process. Any system that experiences entropy sustained through time will naturally arrive at a depleted state in which chaos, disorder, disease or death are the natural outcome. From the holistic perspective, the question of cell phones in relation to cancer is moot. Cancer is a byproduct, which is inevitably caused by entropy. And therefore, the question should be: “Can cell phones cause entropy?”. According to the opinion of one entropy expert, Dr. Gabriel Cousens1, the answer is an emphatic yes! For this research project, Dr. Cousens selected a prototype EMT (electoral muscle tester) developed by Dr. Buryl Pane PhD2 to be used for all measurements. “The EMT is capable of measuring individual increases or decreases in muscular resistance” claims Dr. Payne. An increase in the EMT reading represents a negative entropic response. A decrease in the EMT reading represents an entropic response. The EMT is unique in that it is operated by the individual being tested. This removes the researcher’s subjectivity. Each of the individuals being tested used their personal cell phone during the testing process. Each individual was evaluated either two or three times based on the relevant conclusion. The first EMT reading was acquired to formulate a baseline. Next, the subject, using their personal cell phone would place a call and conduct a common conversation. The cell phone was positioned on either the right or left side of the head as determined by the subject’s preference. Dr. Cousens then acquired a second EMT reading after no less than two minutes of cell phone conversation. The second reading, when compared to the subject’s baseline, would reveal whether talking on the cell phone had an entropic or negative entropic effect. If the second reading revealed an entropic response, Dr. Cousens would install a Tachyonized Phone Micro-Disk on the battery compartment of the subject’s cell phone. (The Tachyonized Phone Micro-Disk is reputedly a negative entropic device capable of harmonizing electromagnetic fields3.) . The subject would once again engage in a cell phone conversation in excess of two minutes. During the conversation a third EMT reading was acquired. This reading was compared to the original baseline. Dr. Cousens systematically tested 186 subjects. Baseline readings were acquired first. The second reading revealed 90% of the subjects experienced a significant bio-energetic depletion (entropy) while talking on their personal cell phone. This clearly illustrates that cell phones do in fact give rise to entropy. After installing a Tachyonized Phone Micro-Disk on the depleted subject’s cell phone, a third reading was acquired. 100% of the subjects upon re-testing exhibited a significant bio-energetic increase – even exceeding the baseline. As indicated by Dr. Cousens, the Tachyonized Phone Micro-Disk is the only material he has evaluated that reversed the entropic effects of the test subject. Dr. Cousens’ findings in regards to cell phones and their effect on biological systems clearly answers the entropy question. Cell phones, for most people, have an ntropic effect on their systems. This means that they are depleting the bio-energetics or creating chaos in the user. Dr. Cousens’ findings also provide a proven solution to the entropy problem. Maybe the time has come for concerned individuals to take matters into their own hands. To do so is to be proactive. Some people regularly consume organic food, even though the food industry reports that herbicides and pesticides are safe. Some people drink filtered or bottled water even though the water municipalities say that the water coming out of our faucets is safe. Fortunately we now have insightful studies like the one conducted by Dr. Gabriel Cousens. These studies enlighten us to technological solutions that concerned individuals may employ to protect themselves from cell phone radiation, even though the manufacturers say the radiation is safe. Proclivity has been the trend since the days of DDT. After all it is our future, and the future of our children’s children which is at stake here. A proactive course appears to be the most prudent course. For now, the best solution appears to be limiting our personal exposure, as well as incorporating research proven solutions such as the Tachyonized Phone Micro-Disk. These next photos are part of an extensive research study done at the House of Well-Being in Engetried, Germany. The researchers, Herta and Dr. Hansen, objectively wanted to identify the effects of Tachyonized materials on the human energetic system. As can be seen in Figure K.1., the energetic outline of the hands is weak and in many areas the energy isn’t even measurable. These energy deficiency areas of the hands and fingers specifically represent energy deficiencies in the body. 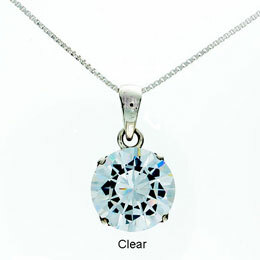 After each client was measured, Dr. Hansen then administered 10 drops of Tachyonized water sublingually and had the client wear a Tachyonized pendant for a total of 15 minutes. Dr. Hansen then remeasured each client. New measurements captured and made obvious the neg-entropic effects of Tachyon. The meridians were energetically reconnected suggesting energetic balance on the physical level. Ma Prem Jwala, at the Osho Mutliversity in Pune, India, conducted similar research. Ma Prem Jwala’s extensive study measured the meridian systems using advanced Kirlian diagnostic techniques invented by Dr. Peter Mandell. Using Dr. Mandell’s diagnostic techniques, Ma Prem Jwala was able to diagnose many of the energetic deficiencies in the body. The research illuminates the neg-entropic effects which bring balance first to the energetic body and then to the physical body. This creates a real opportunity for permanent healing. Her research concurred with Dr. Hansen’s as she demonstrated the effectiveness of Tachyonized materials as healing tools. 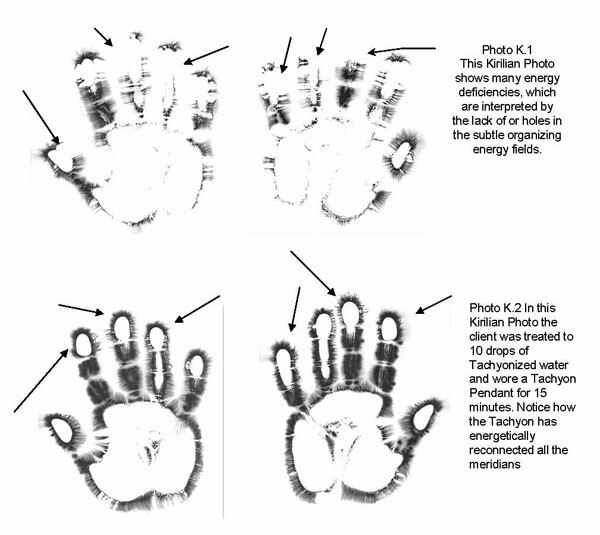 The following Kirlian photo study demonstrates that plants in potted soil display significant increases in their overall energetic field after receiving a tachyon treatment. Out of all the live plants tested and photographed, this burgundy ficus represents the average effect observed. Photographic research has found that plants connected to the soil require much less time to increase the SOEFs than harvested plants or fruits. In the case of this ficus, only ten minutes elapsed between the two photos. 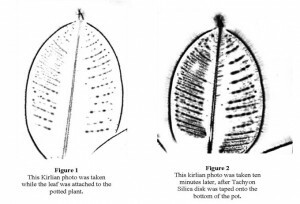 The differences between Figure 1 and Figure 2 are due to the fact that a Tachyonized Silica Disk was taped on the bottom of the pot of the plant in Figure 2. These photos again demonstrate that Tachyon alone enhances the SOEFs of all living organisms, including humans. The prototype of the following study was done in 1992. It has been duplicated countless times in this form and with the use of many varieties of plants, including both cut and potted. In these photos below are two rosebuds cut from the same vine. Rosebud “A” was placed into regular distilled water and rosebud “B” was placed into pure Tachyonized water. Rosebud “A” opened, the stem collapsed, and the flower wilted after several days. This represents the normal life expectancy of this variety of rose. The water for Rosebud “A” was then replaced with pure Tachyonized water. The stem became erect and Rosebud “A” re-opened for another three days. Rosebud “B”, which had been sitting in the Tachyonized water all along, stayed open for nine days without any signs of wilting. We conclude from this that the Tachyonized water continually energized Rosebud “B’s” SOEFs. The SOEFs converted the tachyon energy into the exact frequency needed for the rosebud B to stay balanced and alive. From this we can postulate that Tachyonized materials seem to slow the effects of the aging (positive entropy) process. In the case of rosebud “A”, the effect seem to be partial reversal of the aging process. With the rosebud “B”, where Tachyonized materials were used from the beginning, we see an extension of the life process, as the stem grew roots and was planted. Subsequently the stem developed into a beautiful rose bush. 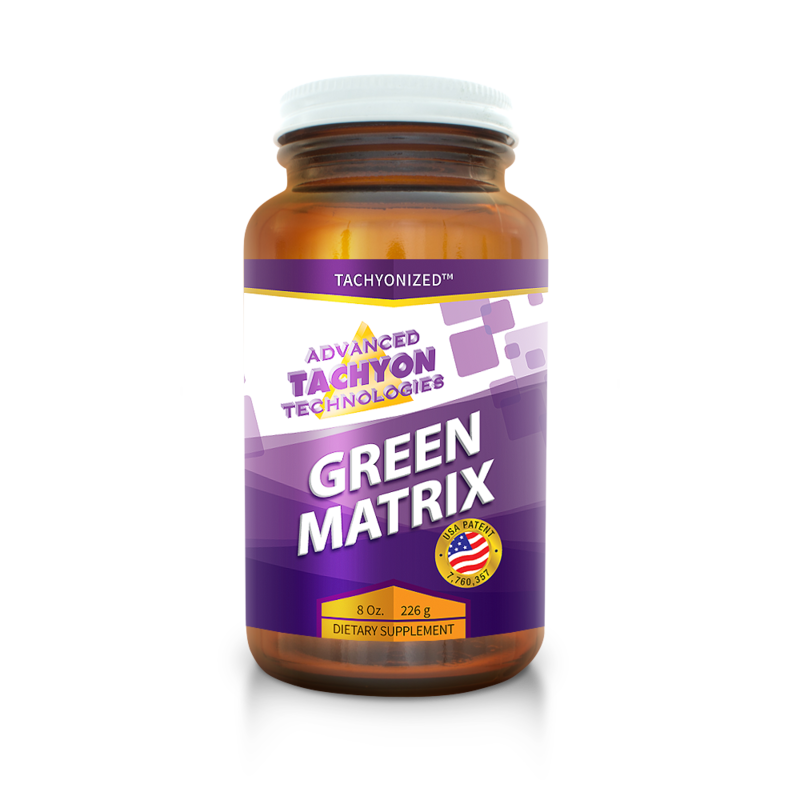 Tachyonized materials have the ability to keep a biological system in balance by promoting vitality and health of the system.